For this Fourth of July week, we have a patriotic photo of former Brewer catcher Hank Helf, recently enlisted in the Navy, visiting Borchert Field in June 1944. Take a bow, sailor. And Hank Helf gets a big hand. The former Brewer catcher is pictured in the dugout when he was a visitor to Borchert Field while en route from San Diego, Calif., to Bainbridge, Md., for specialist training. He saw his former teammates win a double-header, which made the visit particularly worthwhile. 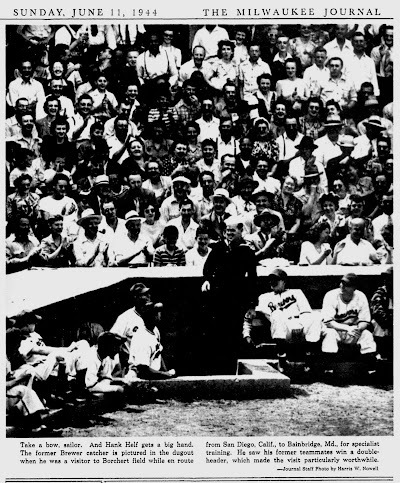 Lot of interest in this photo, not the least of which is Borchert Field's angled dugouts. Squeezing a ballpark into a single city block resulted in some very creative use of space. I also like the triangular notch sticking out into the field. Helf came to Milwaukee in 1937 on a one-year loan from the Cleveland Indians, which had a "working agreement" with the Brewers at the time. He was the Brews' backup catcher that year before being recalled to Cleveland, where he played in a handful of games but spent most of the 1938 season on the bench. While in Cleveland, Helf participated in a stunt with third baseman Ken Keltner, a Milwaukee native and former Brewer himself, who tossed baseballs from the top of Cleveland's Terminal Tower 708 feet down into the gloves of the Tribe's two backstops on the street below (Terminal Tower was then the sixth-tallest building in the world, and the tallest outside of New York City). 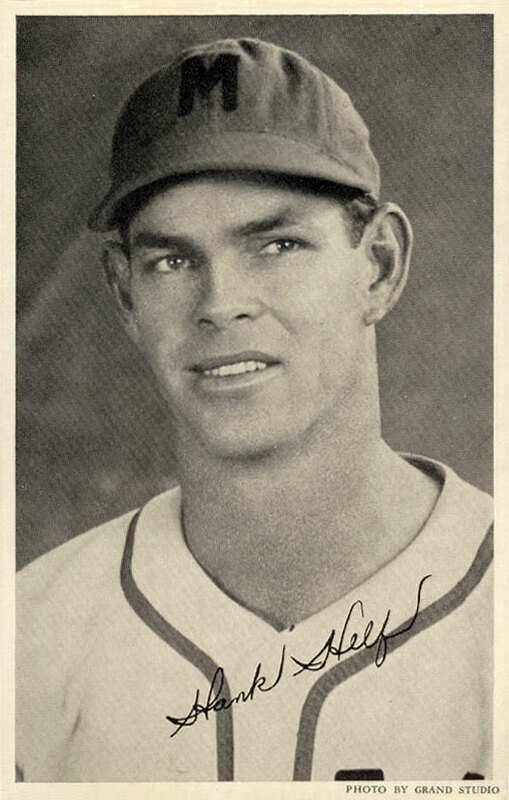 Despite his performance on that day, Cleveland sent Helf back to the minors, where he kicked around for the next few years, aside from one more game with the big club in 1940. In 1943, Brewer president Bill Veeck brought Helf back to the Orchard in a trade for catcher Charley George and pitcher Pete Naktenis. Veeck was looking for someone who could help develop the Brewers' pitching staff, and George was considered too much of a bully. A chronic sore shoulder, hampering George's throwing, probably didn't help, either. Helf had no such problem; his pickoff move to second was among the best in the Association. Helf quickly became one of the best backstops "in this or any other league", according to the Milwaukee Journal. He was noticed by the majors, and the St. Louis Browns picked him up from the Brewers for $7,500 following the 1943 season. Three months later, on February 2, 1944 Helf enlisted in the Navy (we can only speculate if he was in any way a comment on the state of the lowly Browns). Four months after that, he stopped off in Milwaukee to visit his old club and catch a twin-bill at the Orchard. He was introduced to the cheering Borchert Field crowd during the fifth inning of the first game, a Brewer win over the Kansas City Blues, leading the Journal photographer to snap the picture at top.